This week we catch up on a topical news story and driving dogs, along with 8 great tracks! BBC News | Should children be given driving lessons? 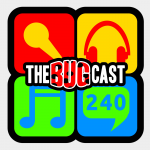 The next show will be episode 241 – broadcast live in the chatroom on Friday 14 December from 21:30 UK time.